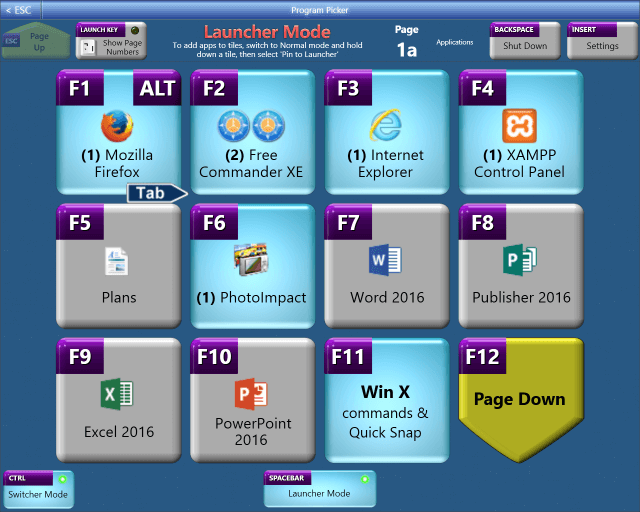 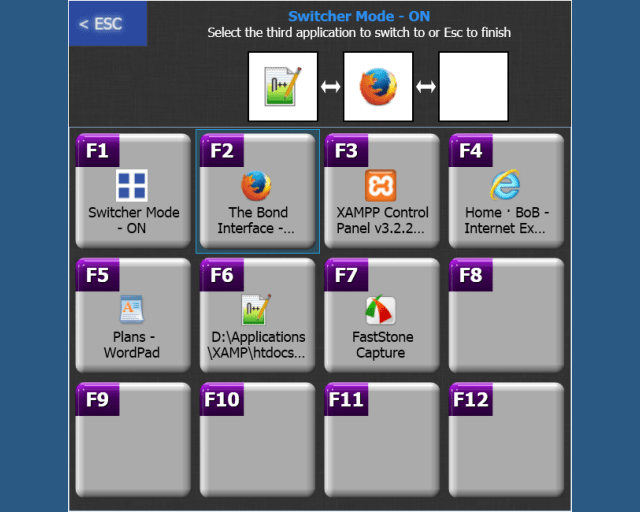 Fast and easy program launching and task switching, using just two consecutive keys to launch and switch to up to 40 different programs and/or files. 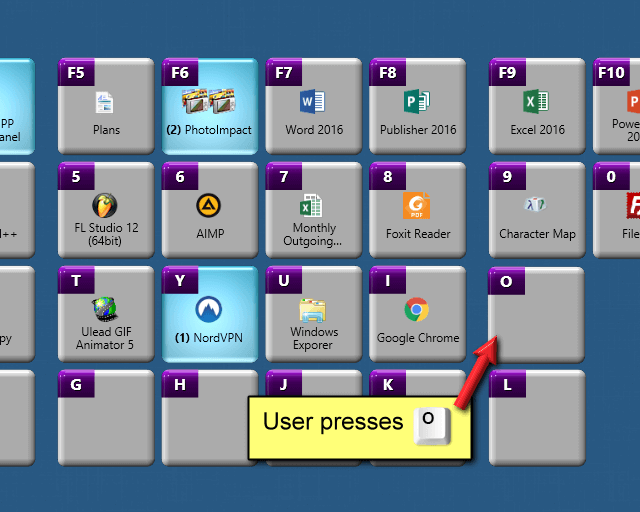 Pin up to 8,000 files and programs on Program Picker tiles - access any of the first 1,600 with just four consecutive keypresses. 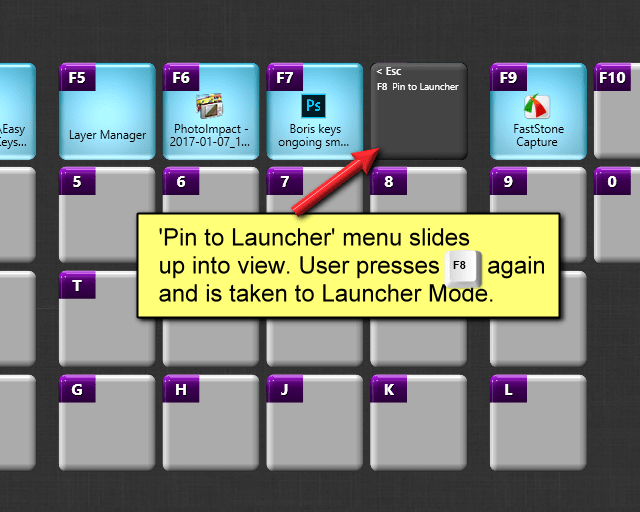 Launcher Mode - pin your favourite programs and files to tiles. 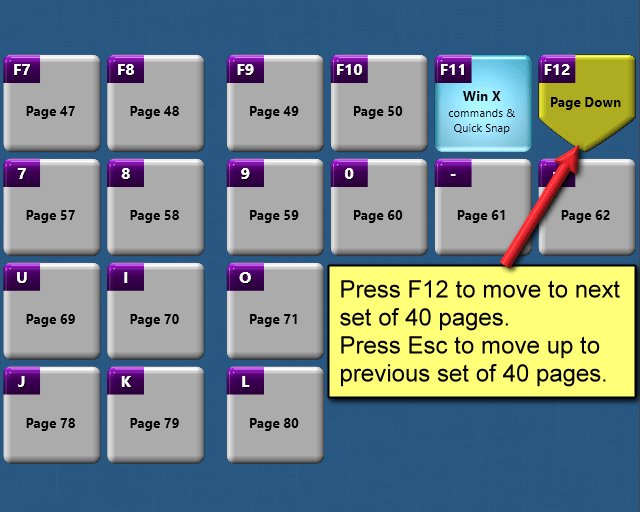 40 tiles per page. 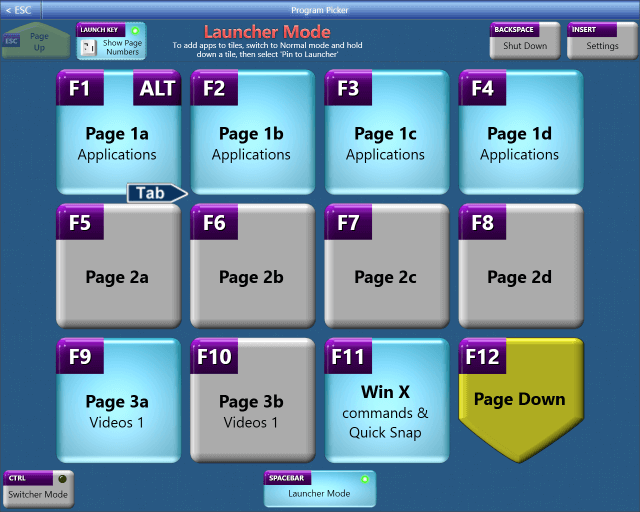 200 pages available. 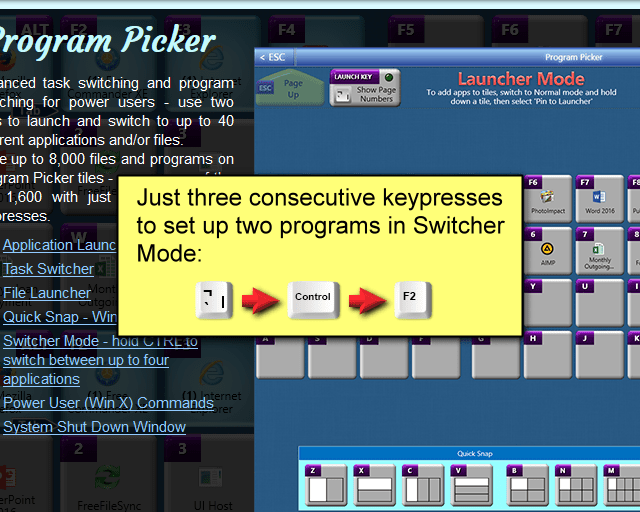 From any program, launch (and switch to) any one of 40 programs using just two consecutive keypresses. 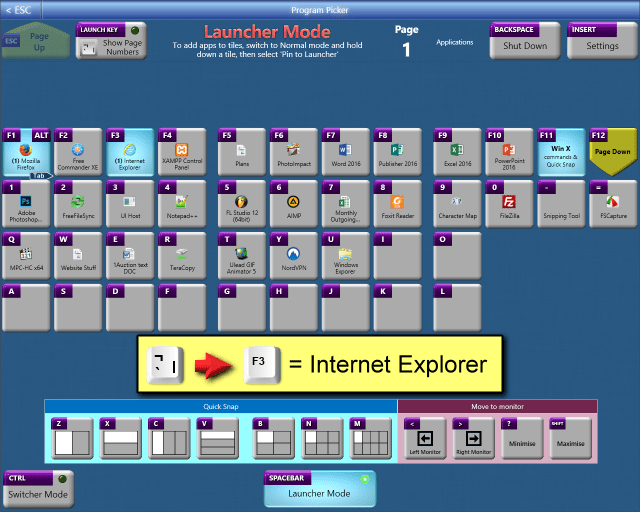 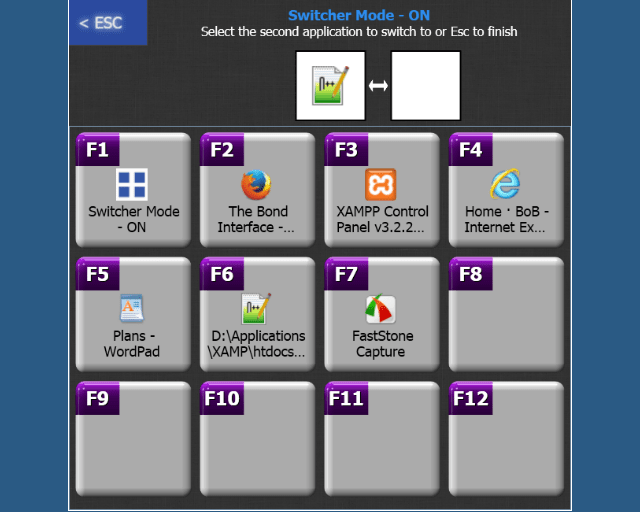 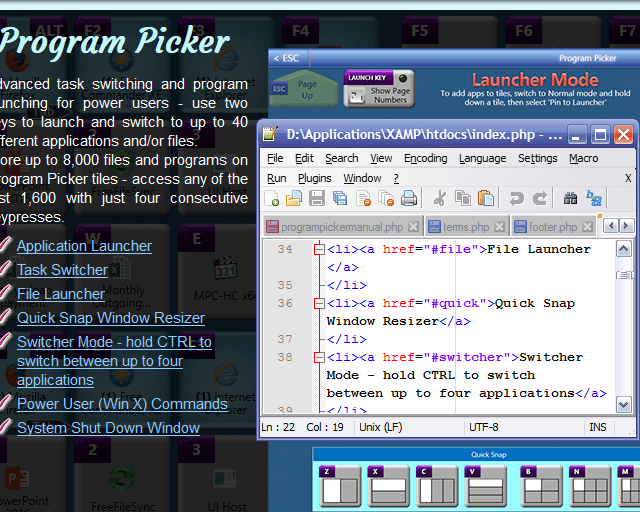 Example 2: Press ¬ to switch to Program Picker, press F3 to launch Internet Explorer. 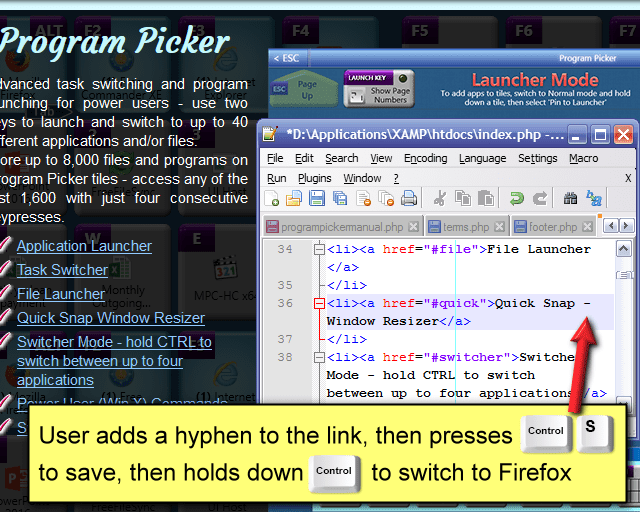 Example 3: Press ¬ to switch to Program Picker, press F1 to switch back to Firefox. 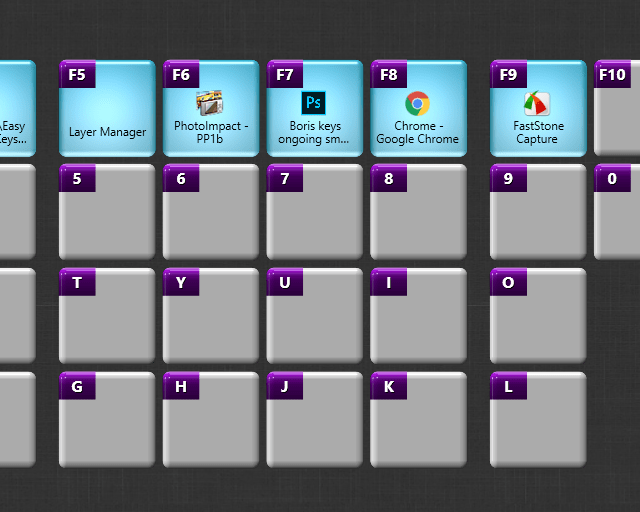 This is much faster than the built in Windows 'Alt Tab' task switcher, especially when you have many applications open. 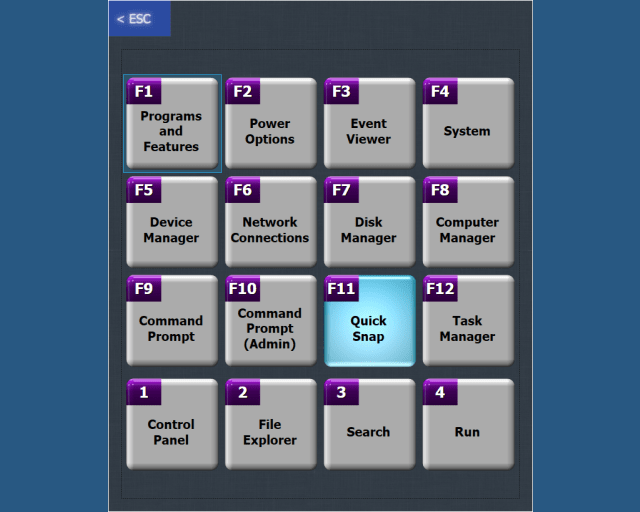 Each application stays in the same place, so you always know which key to press to access it. Normal Mode displays currently running applications. 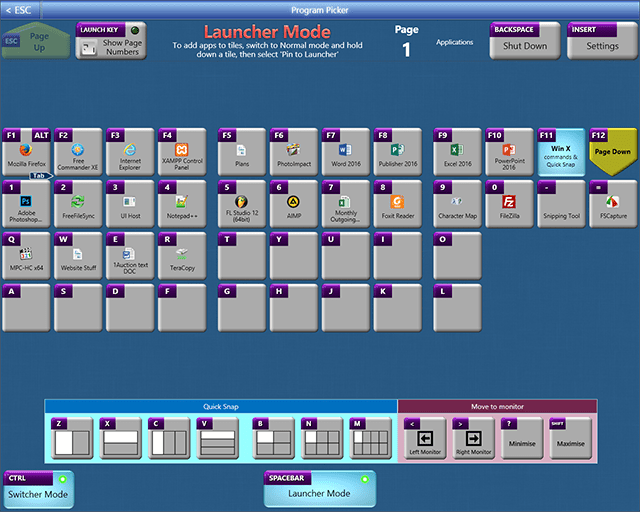 Use it to switch to applications, and to add them to Launcher Mode. 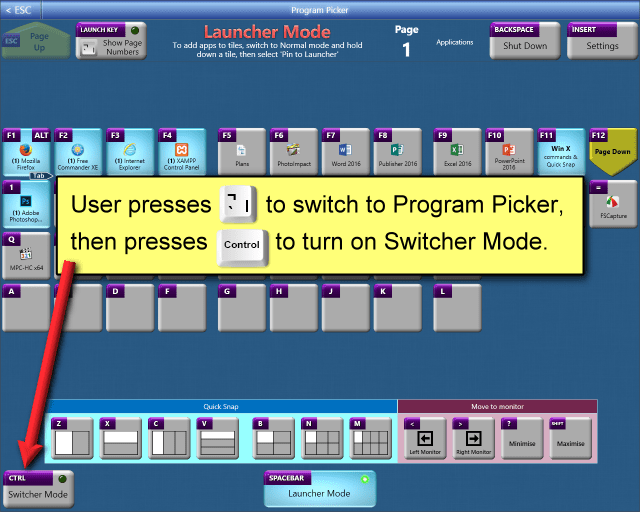 To pin new applications to Launcher Mode, simply start your applications, go to Program Picker Normal Mode, (press Space Bar to switch between Launcher Mode and Normal Mode), hold down a key to view the 'Pin to Launcher' menu - and press the key again to go to Launcher Mode. 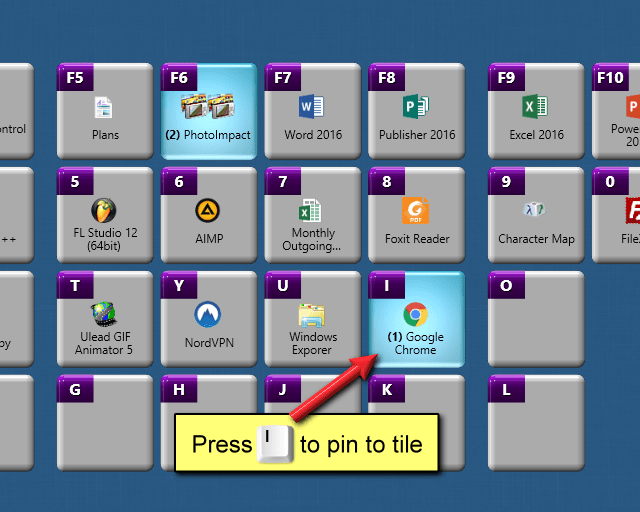 Press the key of the tile you want to pin the application to, in this example, tile 'I'. 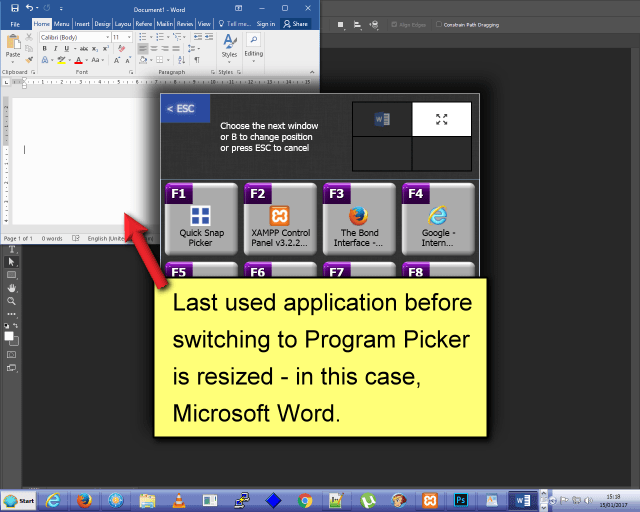 Hold down key to show tile menu - Move App to another tile, Remove App from tile, Pin a file to tile, Expand tiles (for multiple instances of the same application), and Edit Title of tile. 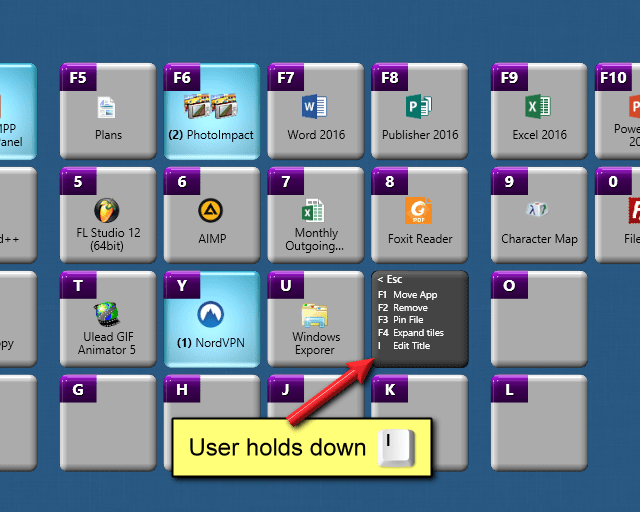 To pin a file to an empty tile, press its key to open the file menu. 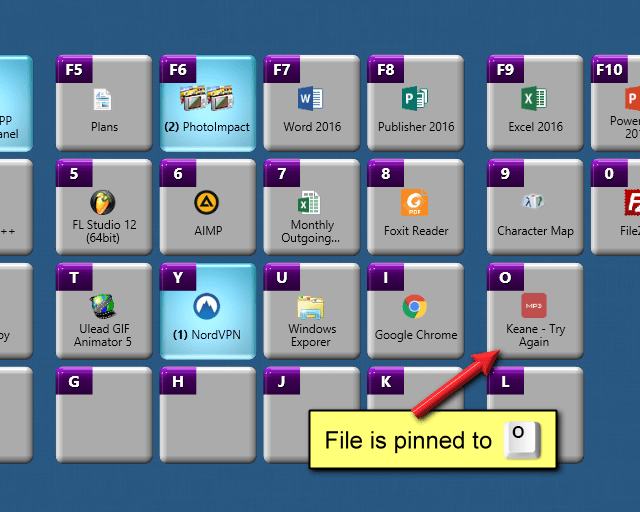 Select the file you want to pin, from the 'Select a file to pin' file window. 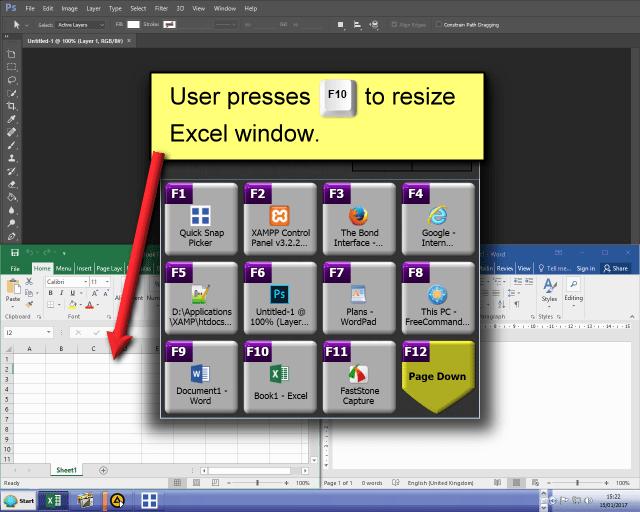 The file is now pinned and can be launched by pressing the 'O' key. Show Page Numbers screen - press launch key a second time to access the Show Page Numbers screen. 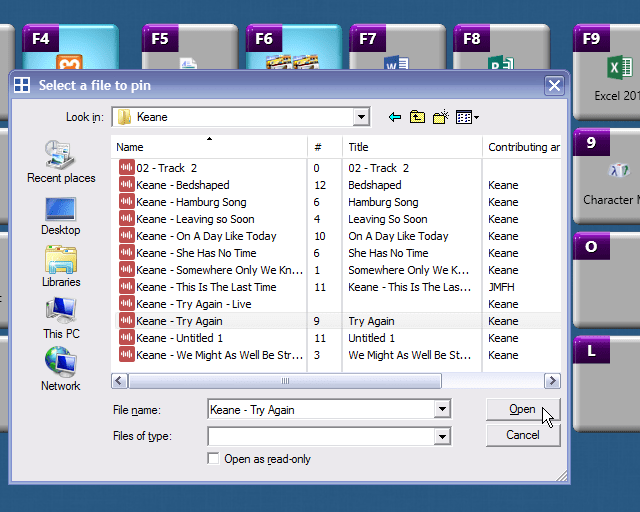 Pages containing pinned programs or files are highlighted in blue. 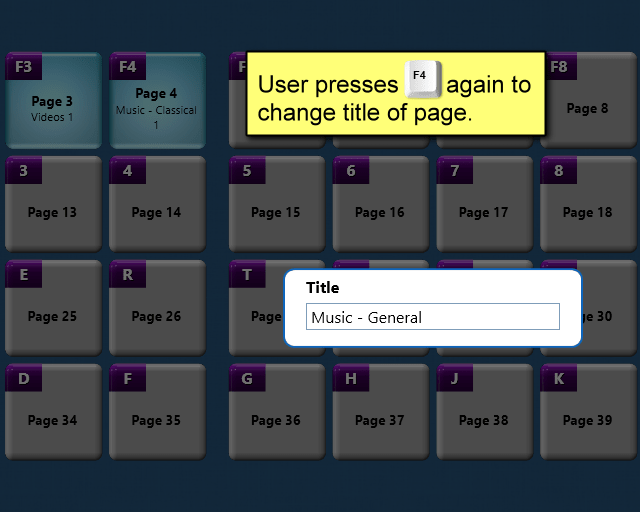 Press the key of the page you wish to go to. 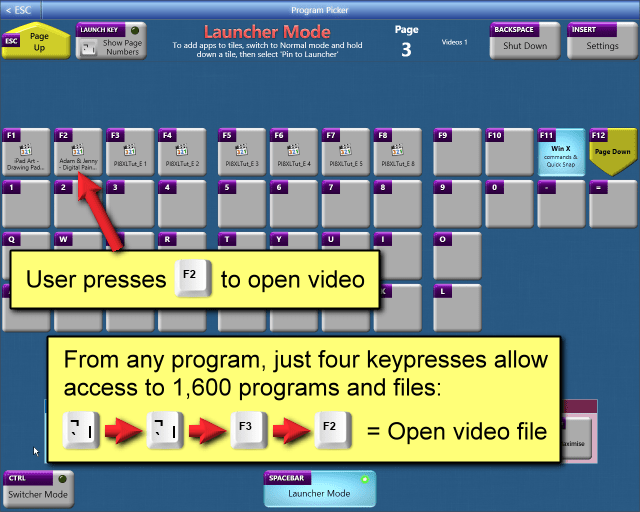 Use two consecutive keys to launch up to 40 programs - then use the same two keys to switch to the running programs. 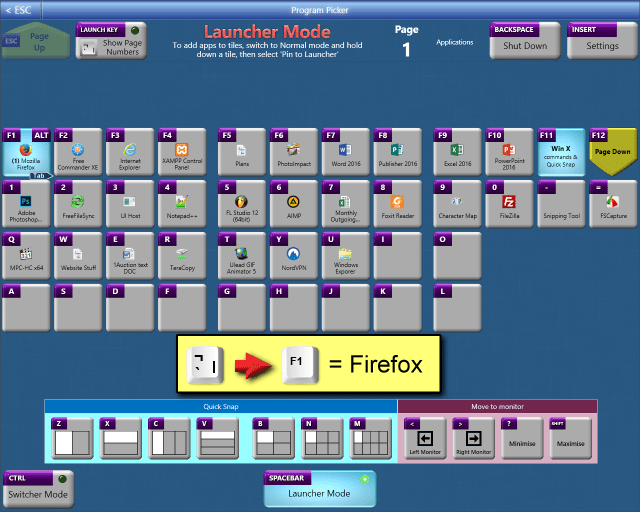 to switch to Program Picker, then to open Firefox. Once Firefox is running, press then to switch back to Firefox from any other program. 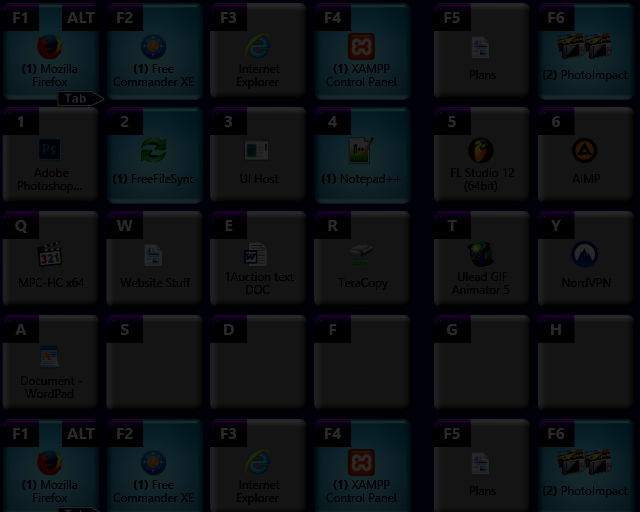 Running program tiles have a glowing blue background, so you can easily see which programs are already open. 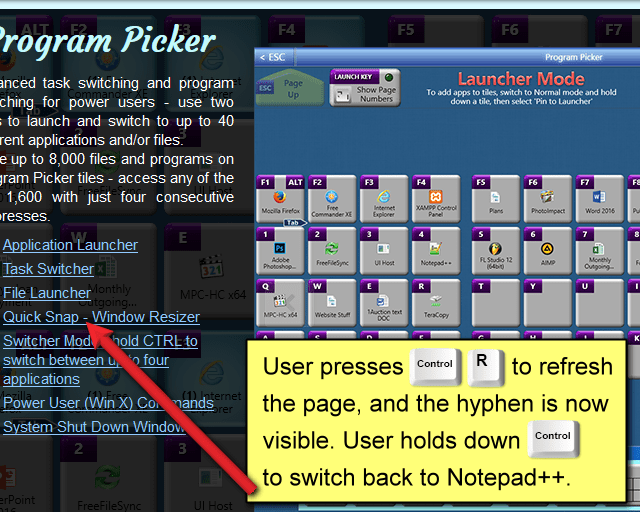 Alt-Tab users: press Alt Tab and then let go - Program Picker will stay open. 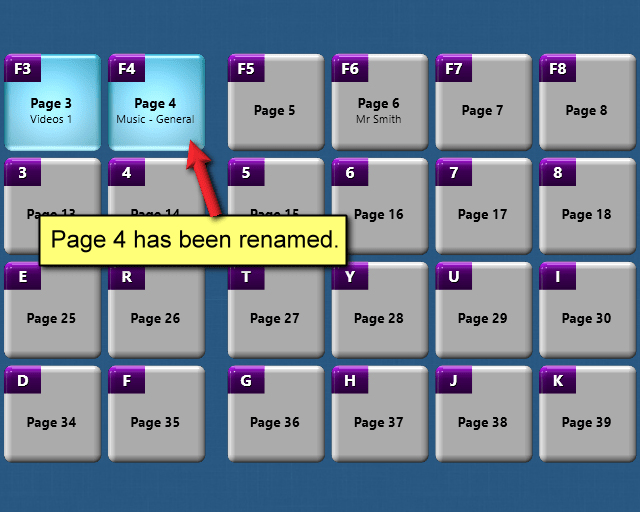 Press Tab to move across the tiles, then press Alt to select the current tile (either to open the program, or to switch to it). 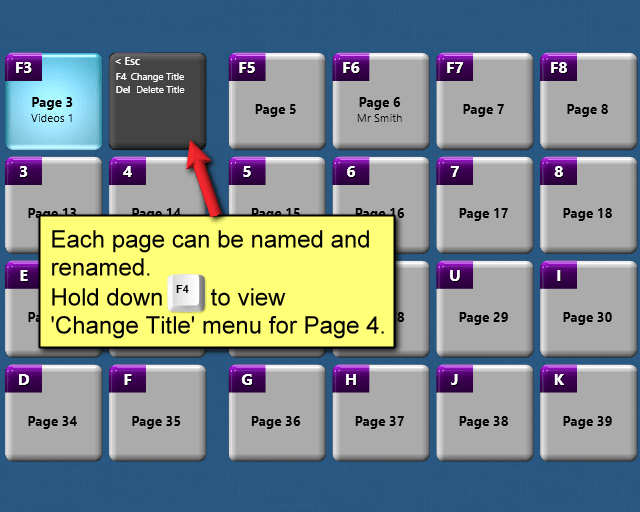 You can now run the file by just pressing the key of the tile, or by clicking the tile. 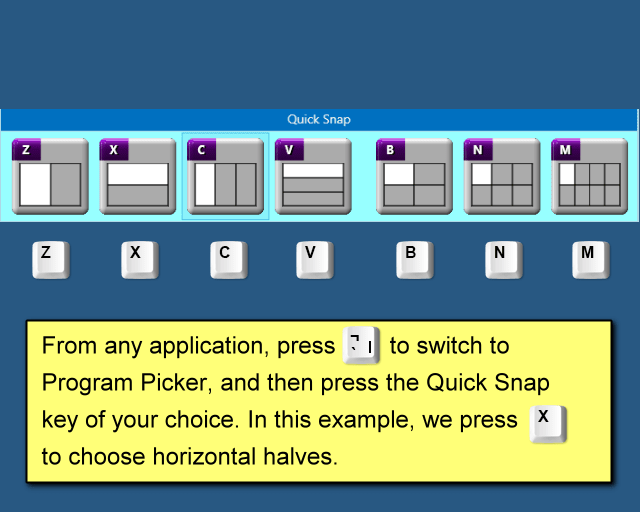 Quick Snap. 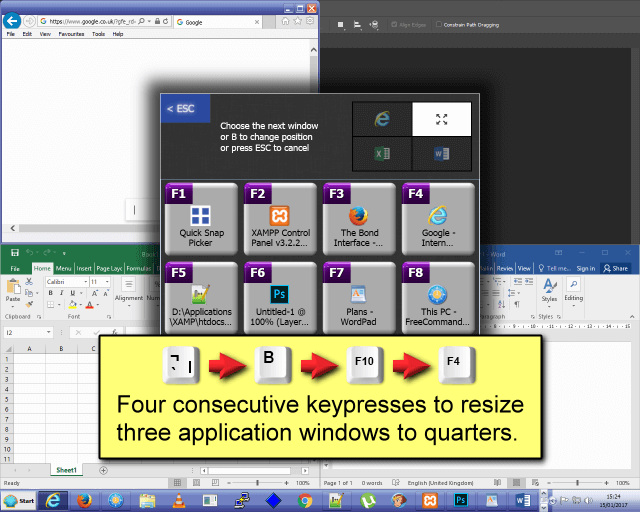 Resize program windows using consecutive keyboard keys. 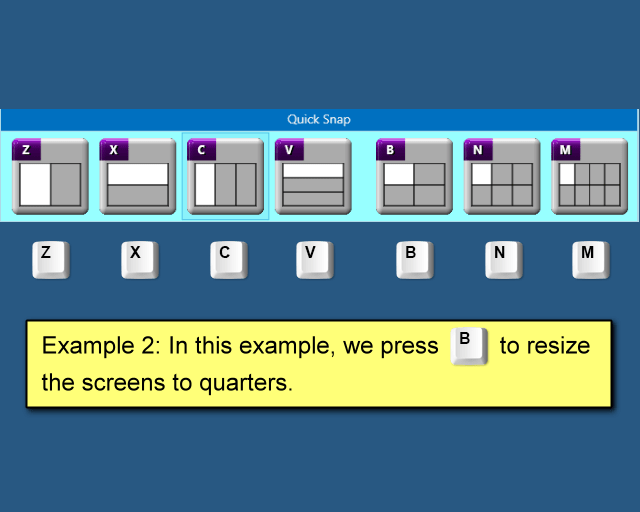 Halves, thirds, quarters, sixths and eighths. 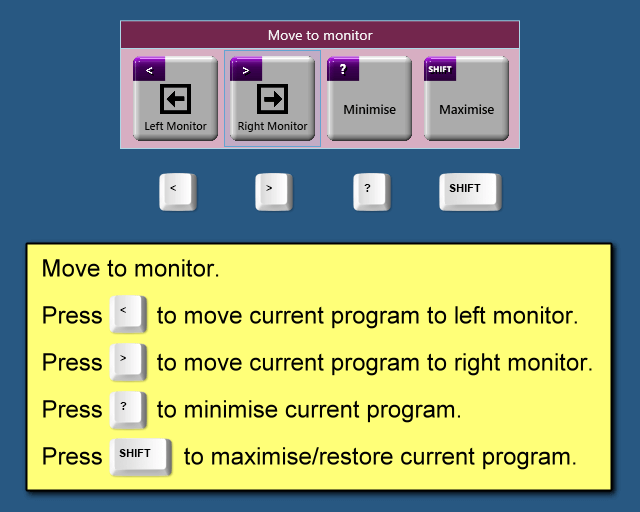 Last used program resizes to top half of screen. 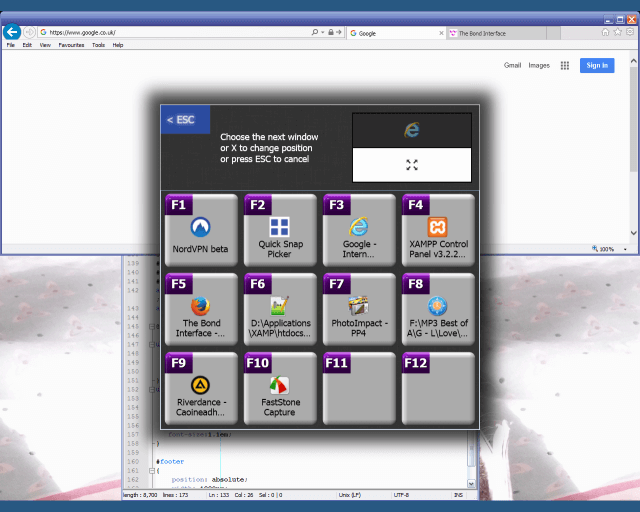 Select second program to resize using a function key, in this case F6 for Notepad++. 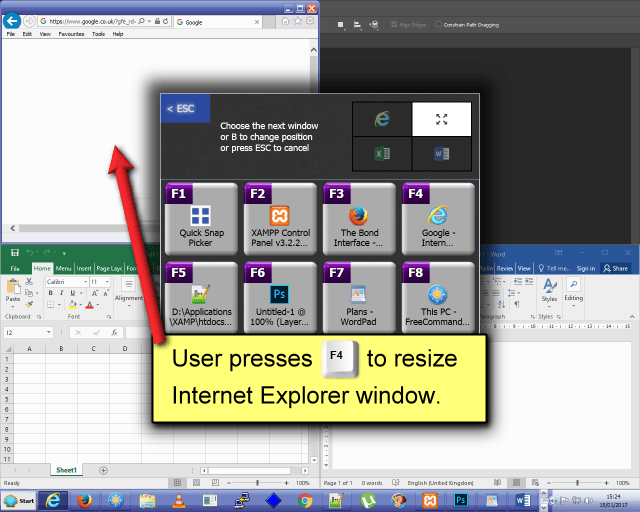 Notepad++ is resized to bottom half of screen. 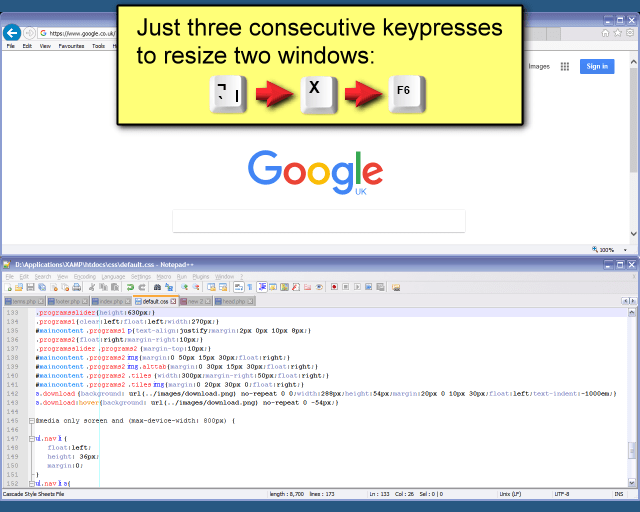 Easily resize program windows to halves, thirds, quarters, sixths or eighths of your screen, using consecutive keypresses. 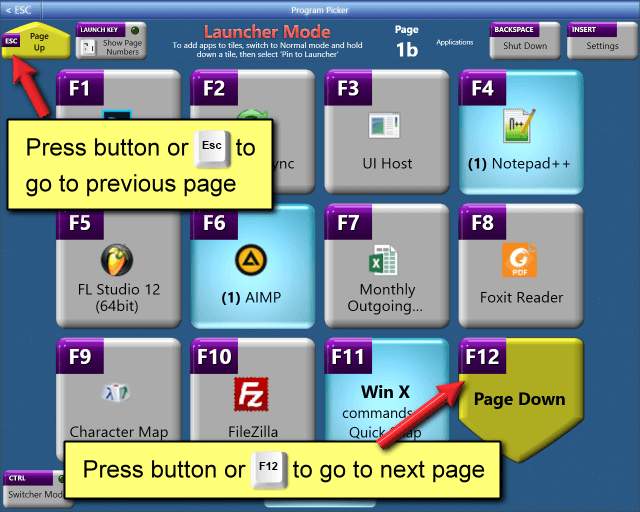 Quickly access Power User commands by pressing F11. 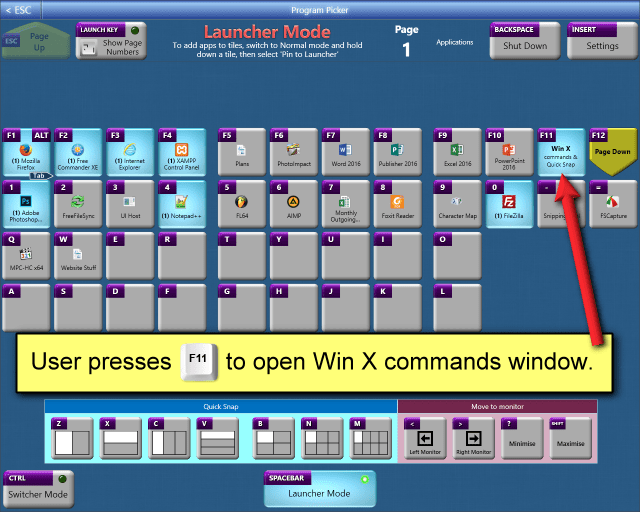 Press the function key of the command you require, or click the onscreen button. 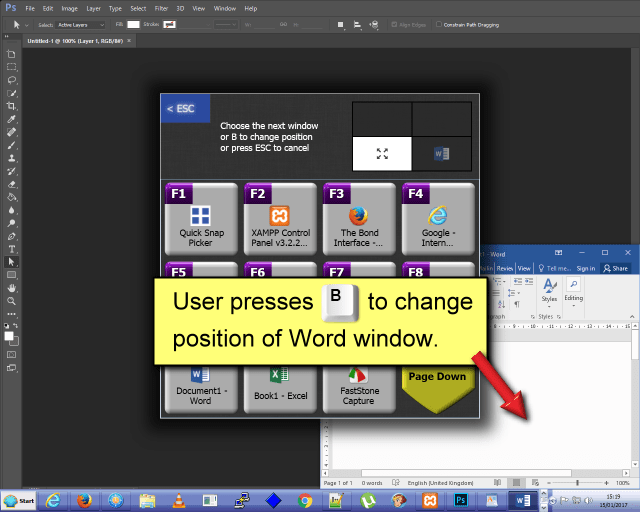 Press the Backspace button when in Program Picker to access the Shut Down Window. 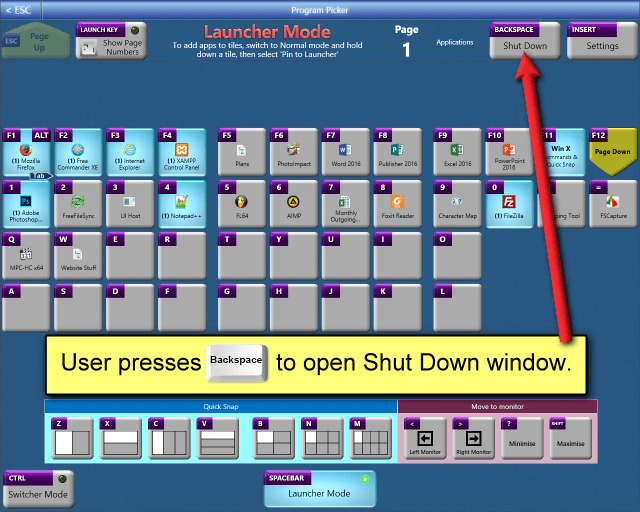 The Shut Down Window allows you to select the six shut down options (Shut Down, Switch User, Log Off, Lock, Restart or Sleep) using a function key, or by pressing the onscreen buttons, which were designed to be much easier to hit on a touchscreen than the conventional Windows Shut Down menu. 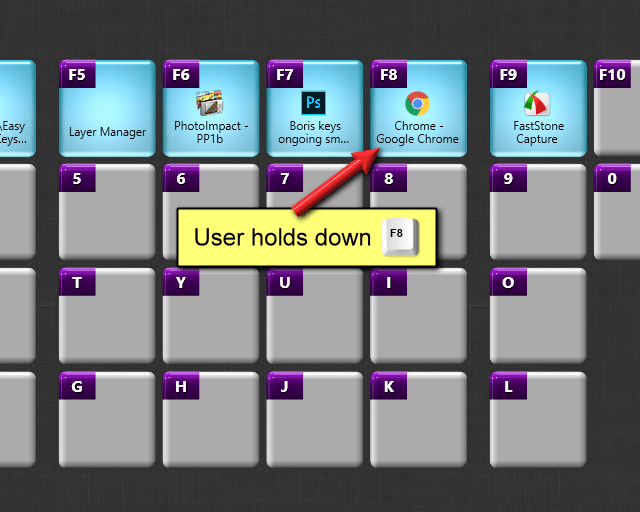 Press the function key of the shut down option you require, or click the onscreen button. 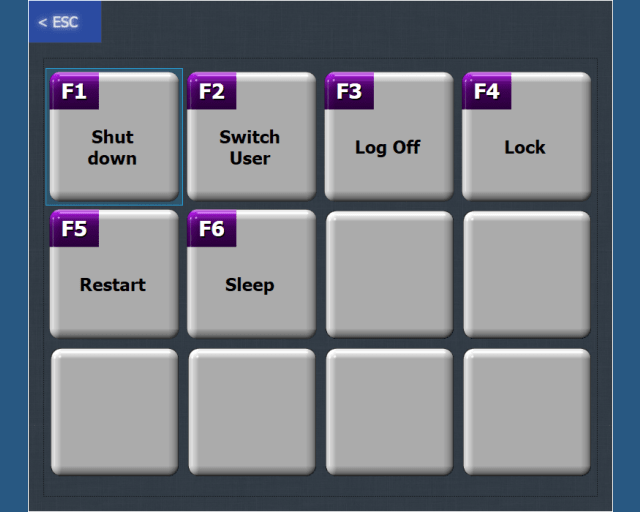 Large buttons for tablet touchscreens. 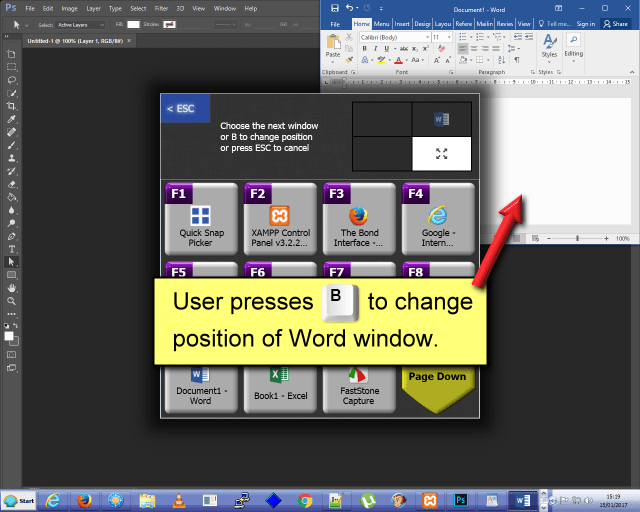 All commands available in Desktop Mode are available in Tablet Mode.